There are a dozen good reasons to choose the compact and reliable entry level product and wire identification benchtop printer that offers great value for money. It's ideal if you require low volumes of various, quality identification labels - from 10 mm to 112 mm wide - that are durable in different contexts within the electrical, voice- and datacommunication, lab and specialized electronics markets. 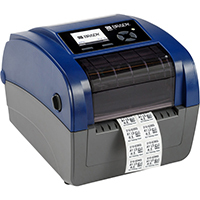 It is designed to get your label printed in 1,2,3: easy media calibration, full colour LCD display, intuitive software user interface, default ethernet connectivity and USB2.0 to connect any universal keyboard. The Brady Workstation Basic Software Suite is included with every printer, all you need to do is download it on Workstation.BradyID.com/Free.